The last time that the DCTA and DPS Bargaining Teams met, on June 21, the District gave a proposal that doubled down on one-time incentives, lowered base pay for teachers, and gave a presentation on how they had already decided to spend the $47 million in additional money they received from the State after the April 27 teacher walkout. Unfortunately, that session was much more productive than last night’s. 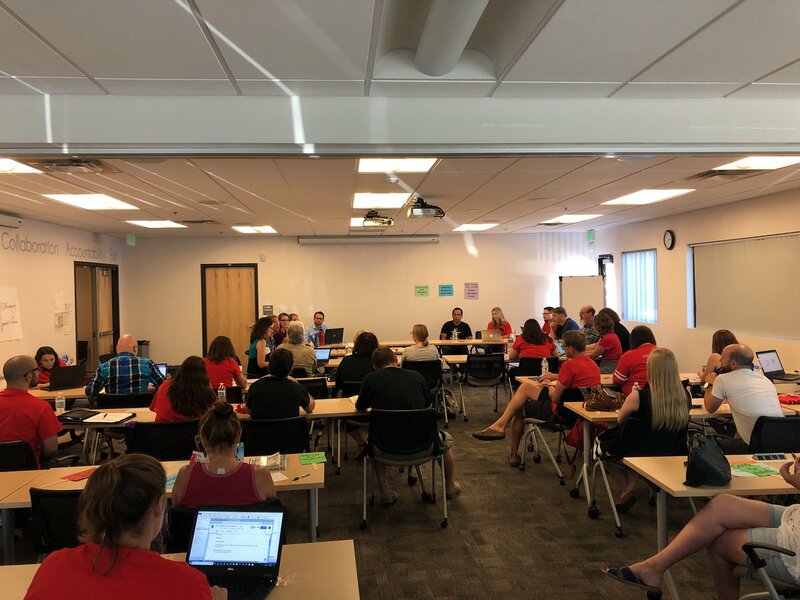 To open the first public bargaining session since June, DPS, who owed a counter proposal to teachers after DCTA submitted its own counter to end the June 21 bargaining session, came to the table with no counter proposal in hand. Instead, their team, with Tom Boasberg in attendance, pledged to provide more money to teacher salary only if Initiative 93 passes in November. Tom made a similar pledge in the spring that he would give teachers more money if he got it from the State. We are still waiting for him to honor that pledge. The District also suggested that no bargaining take place for the next three months until that happened. What else happens in three months? Tom Boasberg will have left the District. Unfortunately, rather than trying to fix the problematic system that he was instrumental in designing in 2008, Tom has decided to cut bait and run, leaving the next Superintendent to inherit his mess. The DCTA Bargaining Team reacted by telling the District that this approach was not acceptable. Following the April 27 teacher walkout, CDE reported that DPS received an additional $50 million in additional funding. In June, DPS clarified that the actual number was $47 million. The current proposal on the table from DCTA costs much less than that amount. DCTA committed to working hard to make sure Initiative 93 passes, but believes that both sides should continue to work to fix this broken system now. It is not acceptable to hold our negotiations, which have been going on, off and on, for five years, hostage. If Initiative 93 passes in November, it would be great to sit down with the new Superintendent and talk about how to put more money into a system that teachers are happy with, rather than to give that person a broken system with only two months to learn and fix it. Although DPS stated that they will not bargain again until November, DCTA will still schedule its planned monthly public bargaining sessions and continue to pressure the District to bargain in good faith. DCTA is committed to making every attempt to get an agreement before January 18, but if the District refuses, teachers will have a decision to make. We ask that teachers start saving money and cutting costs wherever they can in preparation for a strike after January 18, should that become necessary.